Term paper can be defined and re-defined in several ways. So, rather than going through the several meaning we can stick to a basic concept that term paper is a lengthy piece of written work prepared by the student on any of the topic that is related to their course. Proper framing of the given topic i.e. if the topic is too broad, students must be able to broaden it up and if the content is too large students need to build a boundary to develop precision. The topic must be well researched through different mediums and ways such as: articles, news, book and many more such sources. Interaction with different people regarding the topic can serve as positive point to accumulate more information. Strong points must be focused on and trimming of entire information must be done to focus on the ideas that are more vital. Term paper must be started with the outline first. This outlines serves provide backbone for the entire paper and most importantly students gets to know the destination that they need to reach and the path that they have covered. Term paper must be started with an introduction, so this paragraph must be striking, to the point and simple. It must be like a trailer of a movie that motivates the reader to go ahead with the written documents. Body of the term paper must be strong enough to convince the reader on the mentioned subject. Evidences and proofs must be the medium to support the written arguments and any past or present information related to the topic must be smartly depicted, hence this informative part of the paper must serve like a pillar to the overall work. Finally, conclusion of the term paper must be done with a sentence that makes the reader think on the subject of the term paper deeply. The paper must be wrapped by restating the thesis statement and an important detail on the topic. Term paper must be written in a particular format, whether it’s APA or MLA style. Hence, it is equally important for the writer to first study about this format and presents the term paper in meaningful and organised way. Sentences engraved in the paper must be sensible and meaningful. It must be framed in proper way only than every paragraph can clench the readers mind. Term paper must be rechecking for any grammatical or spelling errors. Rechecking helps to correct any of the mistakes committed in the paper. Thus, these are some of the steps to from an effective and impressive term paper. We can figure out that writing term paper homework and assignment requires research, correct use of grammar and sufficient time. Therefore, whenever students are assigned the task of writing a term paper, they face problem with all these factors. Firstly, in 24hrs of time students finds it difficult to complete these many assignments along with studies on specified time. Secondly, every student aren’t good at writing and expressing things, they generally find difficult to engrave things in a particular format and thirdly, research needs to be done in a most appropriate way to have a satisfying result. 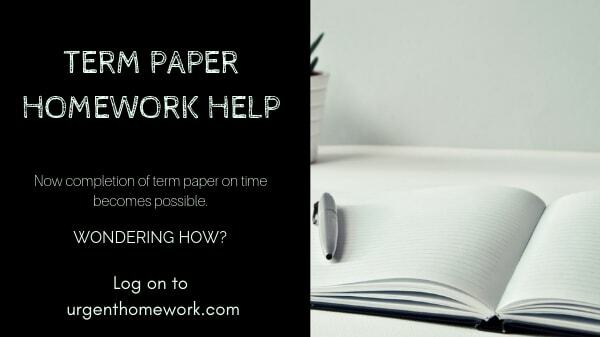 Hence, students gets stressed up when they had to term paper homework and assignment and submit it on specified time and in this tensed situation they tend to make more mistakes and along with the assignments, their studies also gets hamper. Hence, to help students and make them focus on their subjects, urgenthomework.com provides a great supporting hand for this job. It is the online way of acquiring knowledge on any of the desired subject and hence reducing the risk of losing any marks. Students get the solution of all their queries and thus a proper guidance from the teachers. Since it is an online process of completing the task, therefore researched material and all the concept regarding the topic is proper explained by the teachers to the students. Since, the site provides 24*7 services to the students, so all the doubts can be cleared immediately so that completion of term paper on time becomes possible.